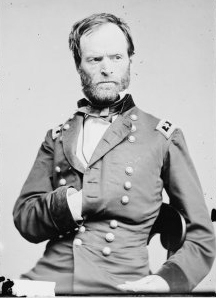 On January 16, 1865, after his successful march through Georgia, Union General William T. Sherman issued his Special Field Order No. 15, which confiscated 400,000 acres of land along the coast stretching from Charleston, South Carolina, to the St. John’s River in Florida, including Georgia’s Sea Islands and inland as much as thirty miles. The order redistributed the land to newly freed black families in forty-acre segments. On January 12 Sherman and Secretary of War Edwin M. Stanton met with twenty black leaders of the Savannah community, mostly Baptist and Methodist ministers to discuss the issue. Lincoln approved Field Order No. 15 before Sherman issued it four days after meeting with the black leaders. Radical Republicans in the U.S. Congress, like Charles Sumner and Thaddeus Stevens, had been pushing for land redistribution for some time in part to break the back of Southern slaveholders’ power. But from Sherman’s perspective the most important thing about the order was it relieved him of the burden of providing for the thousands of black refugees who had been following his army since it had invaded Georgia. With the refugees cared for, he would continue his campaign without the additional burden of providing for and protecting them. The order called for the settlement of black families on confiscated land, encouraged freedmen to join the Union army to help sustain their newly won liberty, and designated a general officer to act as inspector of settlements. Inspector General Rufus Saxton would police the land and work to ensure legal title of the property for the black settlers. In a later order, Sherman also authorized the army to lend the new farmers mules. Six weeks after Sherman issued his order, on March 3, 1865, President Lincoln established the Bureau of Refugees, Freedmen, and Abandoned Lands. The Freedmen’s Bureau, as it became known, had the authority to give legal title for forty-acre plots of land to freedmen and white Southern Unionists. However, the effect of the order was short-lived: that fall, after Lincoln’s assassination, President Andrew Johnson overturned Sherman’s directive and returned all confiscated land to the planters who had owned it. Sherman’s Special Field Order No. 15 is probably the origin of the phrase “forty acres and a mule.” Moreover, it is referenced in contemporary arguments in favor of slave reparations as an example of the federal government making restitution for slavery. Myers, Barton. “Sherman’s Field Order No. 15.” New Georgia Encyclopedia. 17 September 2014. Web. 23 November 2014. The Civil War in Georgia, John C. Inscoe, ed., p. 177. Although Sherman is at times viewed as a ‘racist’ by modern standards this act was his boldest and, if allowed to stand, would have changed America forever. Former slaves would have obtained political power and justice through a program of land redistribution and those disloyal to their country would have paid a price for their actions. They would not have lost all their land but that part used by slaves for their benefit. It is impossible to play the ‘what if’ game with history but I believe this policy would has succeeded.